. . .remember me? It’s been a while. But I’m back. Back with exciting news! Over the weekend the whole family congregated together for a pretty special celebration. While there (just when I thought I might be through Nana’s recipes by the time I’m ready for retirement) I discovered there are more of her books! My cousin Damian and his wife Jacki had also picked up some of Nana’s recipe books. And boy are they gems. Real gems. Beautiful little notebooks full of recipes written in Nana’s famous script (she really did have the most wonderful handwriting). We all gathered around the books to see if our favourites were in there. Jacinda was desperate to find the Golden Syrup dumplings that Nana would make for Christmas. I scrambled to find her famous Sponge Cake. Judy mentioned the Lemon Slice she used to make. Mum got excited for the Sausage Rolls. There is Chocolate Marshmallow Slice, Powder Puffs, Peanut Butter Caramel Slice, Pavlova, Nut Loaf, Bread Pudding. . . Are you salivating yet? There are even recipes from my Pop’s mum as well as a recipe from my Dad’s mum scrawled onto the letter head of my Granddad’s old dental surgery note paper. So much history in one book. 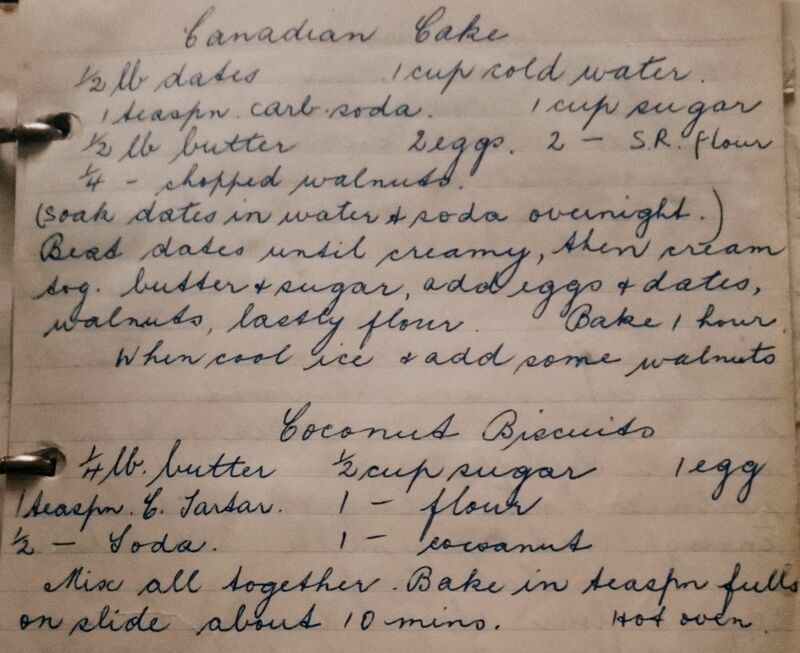 This entry was posted in Cakes and Slices, Main Course and tagged Family food, family history, old recipes. Bookmark the permalink. You are so right. It’s amazing how the recipes change over time and reflect what was happening socially. It’s fascinating! Like reading a delicious history book! Thanks Sharon! It is so lovely to hear from you and your memories of nana. Reading your comment brought a tear to my eye. I’ve given Kaye a big squeeze for you! Hi, I'm Kate. I'm embarking on a mission to recreate the thousands of recipes left to me by my Nana, Kath.